In nineteenth-century England, a boy is about to discover a mysterious mechanical world he may never escape.Ten-year-old Jack Foster has stepped through a doorway and into quite a different London. Londinium is a smoky, dark, and dangerous place, home to mischievous metal fairies and fearsome clockwork dragons that breathe scalding steam. The people wear goggles to protect their eyes, brass grill insets in their nostrils to filter air, or mechanical limbs to replace missing ones. Over it all rules the Lady, and the Lady has demanded a new son--a perfect flesh-and-blood child. She has chosen Jack. His only hope of escape lies with a legendary clockwork bird. The Gearwing grants wishes--or it did, before it was broken--before it was killed. But some things don't stay dead forever. 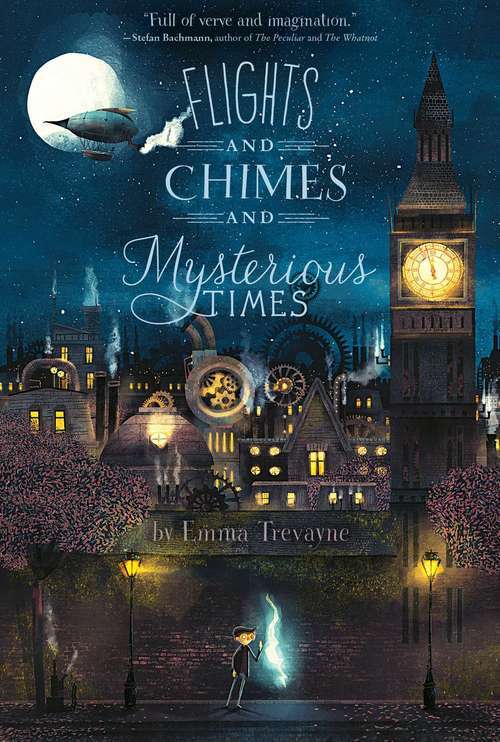 Fans of books like Splendors and Glooms and Goblin Secrets will find Flights and Chimes and Mysterious Times irresistible!